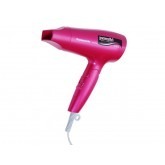 Compact, lightweight and lets you blow dry quickly and comfortably. Silk-Epil Xelle EE5280 Easy Start Body System. Discover the revolution in epilation for silky smooth skin. Top technology and attachments that lock securely into place make this Infiniti by Conair? 1875 watt hot-air styler perfect for all of today&apos;s hottest looks. Tourmaline Ceramic? ionic technology smoothes down cuticles to reduce frizz and leave hair more manageable.